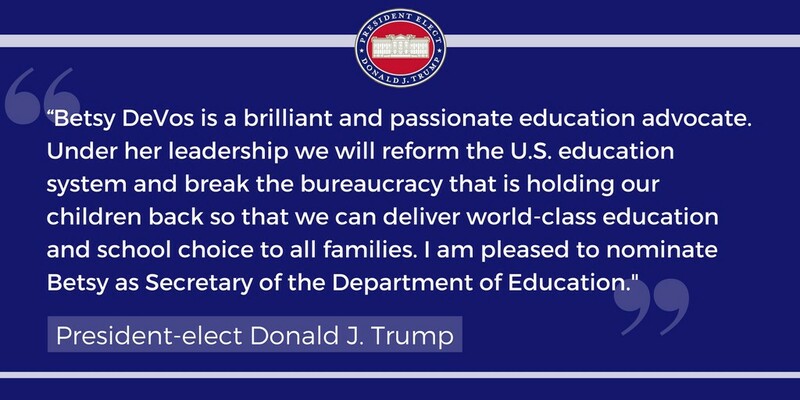 (New York, NY) — President-elect Donald J. Trump today announced his intent to nominate Betsy DeVos as Secretary of the United States Department of Education. A leader in the national school reform movement for more than two decades, Betsy DeVos is a highly successful education advocate, businesswoman, and philanthropist. Ms. DeVos is chair of the Windquest Group and has also served on national and local charitable and civic boards, including the Kennedy Center for the Performing Arts, American Enterprise Institute, The Philanthropy Roundtable, Kids Hope USA, and Mars Hill Bible Church.